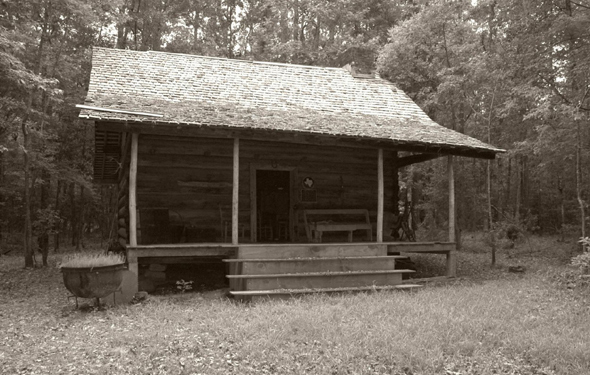 Built in 1867 by Confederate Civil War veteran Nickolas Crane, who had moved to Texas from Alabama in 1848, the Crane Cabin was moved to Montgomery County and restored by B. Carroll and Mae Tharp in 1974. The Sam Houston Memorial Museum will tour some of Walker and Montgomery counties’ prime real estate during the 1800s with a photo exhibit beginning July 17. “Mudcats and Dogtrots: Historic Log Buildings in Walker and Montgomery Counties,” includes approximately 45 pictures, that will be on display through Aug. 31 in the Katy and E. Don Walker, Sr., Education Center. Taken by museum curator of exhibits David Wight and borrowed from Walker County Treasures, the photographs highlight the structural details of houses that were once so common they weren’t carefully documented, Wight said. Inside the Bear Bend Hunting Lodge, built in 1850, where Gen. Sam Houston often stayed while hunting. While some of the pictures in the exhibit date back to around 1896, many of the cabins that are part of the exhibit are dated as early as the 1830s, according to museum director Patrick Nolan. 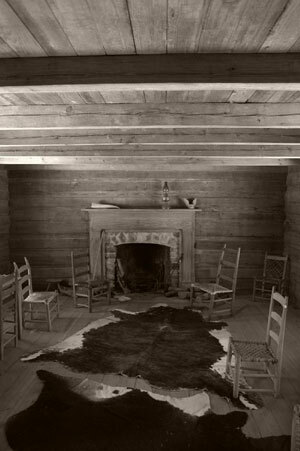 Among the cabins that will be part of the exhibit are the Roberts-Farris cabin, currently located on the courthouse square in Huntsville; Sam Houston’s Woodlands Home; the Guerrant Cabin, currently being restored by the Sam Houston Memorial Museum; and the Bear Bend Hunting Lodge, often frequented by Houston when hunting. Wight, who took approximately 30 of the exhibit’s pictures as a “semi-professional hobby,” said he hopes through his photography “to preserve a legacy of folk architecture that might otherwise have been lost. An opening reception for the exhibit will be held on July 18, beginning at 7:30 p.m. and followed by a performance of Huntsville resident Una Grace Nash’s “Gone to Texas: A Historical Pageant” at 8 p.m.
Narrated by Nash, playing Margaret Houston, “Gone to Texas” tells the life of Gen. Sam Houston through the eyes of many people he encountered in his life, including Margaret, his Indian father Chief Oo-Loo-Te-Ka, his slave Joshua Houston and Gen. Andrew Jackson, among others, all portrayed by area citizens. “It’s all these people who were part of his life and are talking about how they remember him,” Nolan said. The play is based on the actual writings and letters by and to Houston. “When Margaret talks about how she first met Sam Houston as a young girl, it really happened that way. She was living in Alabama and Sam came to a party at her sister’s house,” Nolan said. “He was introduced to her, and she thought he was the handsomest man she’d ever seen. It’s romantic, but it’s true. Both the exhibit and the reception are free and open to the public. The Walker Education Center is located at 1409 19th St.